This happens every day. Especially at this intersection of the McKees Rocks Bridge and Route 65 during inbound rush-hour. In the right lane there’s a long line of traffic … something like sixthy-onehundredthy-million cars…waiting to turn right. All of their drivers doing various things such as talking/typing on their phone, seat-dancing, putting on their make up, smoking, possibly even dozing or demonstrating various nose-picking techniques. The left lane is designated solely for those going straight at the upcoming light. Of course, it is usually a shorter line because the right lane, goes to downtown Pittsburgh. But, in our impatient society, where everybody’s in it for themselves, you can imagine how many people slide up the left lane and try to take advantage of a sleeping driver, a truck driver that can’t get it in gear fast enough, or someone who is reading their smart phone to jump in and skip all of the passive drivers. 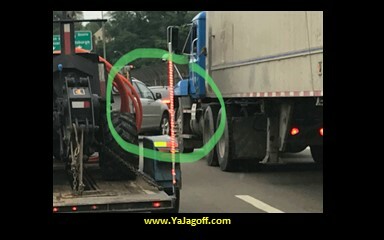 As a side note, there is a second piece of jagoffery in this picture in that there is a tractor or backhoe on a trailer in rush-hour traffic! Shouldn’t they have to go earlier or wait until rush hour traffic is over so as not to clog things up? Back to our man holding up traffic. So now he makes a bad cut-in maneuver and is now blocking the left lane from going forward! I swear they could solve the city/county budget problems withing 45 days if they just cited these people. Dude or dudette, you are so lucky that I don’t carry blow darts in my car that could pop your tire!! Because I’d peg ya like a starving native hunter nails a 120mph cheetah! Listen you self-serving, non-nose picking, non phone-reading, impatient, more important than anyone else driver. We don’t like you because of you’re driving etiquette. But we doubly don’t like you because you seem to be an overachiever. Who in the world wants to get to work FASTER than everyone else?? Get in line and wait your turn.. YaJagoff! !